The area where I live has breezy days, then WINDY days. The type of wind where things not attached securely get blown away, including plastic deck chairs and shingles. Our gate on the side was torn off its hinges more than once (until we took it off completely), and even our garbage bin was blown completely over and across the driveway one night. In fact, after one of our last very windy days, I went out to find most of our apples blown off the apple tree. Out of almost 20 that were ripening, there were 6 left. Windfall, indeed. I was sorely disappointed. 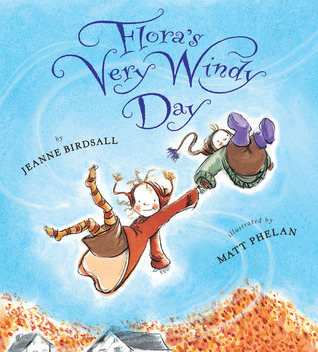 All of that to say, I wasn't surprised to find most of the stories featuring wind were folkloric in nature. The wind is one of those driving forces that lends itself particularly well to being personified. I found some good ones that we'll be coming back to again. Enjoy! The wind starts to blow and the leaves start to swirl. A big storm is coming! Luckily there's a cave to hide in. Count the animals as they find cover in the hill hollow. Once the storm passes, though, there's they notice something else is in the cave with them! Count back down from 10 as they all scurry away again! There's always room for another counting book! This one is a delight. The counting speeds up in some places, as more than one animal comes in or out of the cave. The title page will give your preschooler a clue as to what's going to happen, which adds to the fun considerably. Flora is painting when her little brother Crispin spills the paints and ruins her pictures. Her mother sends them outside. It is a VERY windy day, but luckily Flora has her super-special heavy-duty red boots to keep her anchored to the ground. Crispin, on the other hand, just has regular purple boots. Before long he is lifted into the air and blown away. Before he can get too far, Flora kicks off her boots and sails up after him. She grabs his hand and they go for a ride on the wind. As they float along, Flora gets many offers to give Crispin away, but she insists on bringing him back home again. This adventure is just-right sized for a picture book! They went flying away, but came home safe and sound in the end, to chocolate chip cookies, no less. I liked the way Flora took care of her pesky little brother--even though she was mad at him. It is so windy in Iceland that it is hard to take a walk! 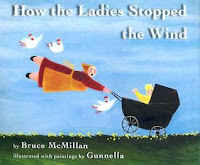 Well, one day some ladies in one of the villages decide to do something about that wind. They buy and plant trees. Though they tend to the trees regularly, they can't stop the sheep from eating them. So they have to keep returning to square one, until finally they figure out a solution. Offbeat, with some humor added in the illustrations--sheep all leaning sideways, for instance. The ladies were sure determined! Also, they really liked to sing. Thanks to those chickens (for the fertilizer) and no thanks to the sheep, they were able to take a walk in their village eventually, without getting blown away! The cakewalk is coming up, and Mirandy is determined to win it! But first she needs a dancing partner who will do her proud. Surely NOT her friend Ezekiel, who is as clumsy as the day is long. No sir! She's gonna catch Brother Wind himself. Maybe. Everybody keeps giving her lots of good advice about how to do it, but so far nothing has worked! A wonderful little folk tale, with such beautiful illustrations. 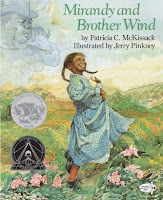 I was not surprised to find it won a Caldecott Honor. I especially liked how loyalty and friendship came center stage at the end. Like many of McKissak's, this one was a longer story, so keep that in mind. 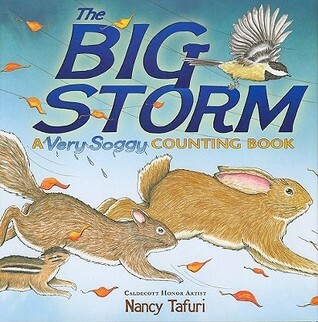 Older preschool kids, or even early elementary school ages would most enjoy listening to this one. Not that there are any tough subjects or anything in it, though, so if your littler one has the attention span--go for it! 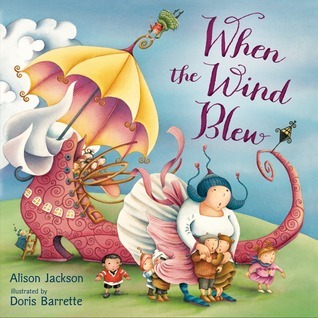 The woman who lives in the shoe rescues the rock-a-bye baby, whose cradle falls from the wind blowing, and sets out with her children to return him. Along the way, they find all sorts of things that need returning to various nursery rhyme characters. Lively illustrations and rhyming text. A fun romp through nursery rhyme land. Plus that pink shoe was just fabulous! What happens when the wind blows? All kinds of things! Short 2-word rhyming sentences describe the wonders of a windy day. The illustrations have a dreamy quality, with bright colors but few hard lines, and the colors seeping into each other. Another good one for younger listeners, or beginning readers. Willa lives with her sister, and as long as the wind blows and the rain falls, they have enough. One summer, though, the wind takes a vacation from working--but he still loves to cause mischief. So when Willa goes to fetch some cornmeal from the barn, the wind blows it out of her bowl. Oh, is she ever mad! So she marches right up to his door and bests him in a shouting match, demanding her cornmeal returned. Instead, he gives her a magic handkerchief that produces food when a rhyme is said. As Willa returns home, she stops overnight at an inn. The unscrupulous innkeeper sees her using the magic handkerchief and steals it out of her pocket while she sleeps, replacing it with an ordinary one. When Willa gets home to show her sister, of course nothing happens. So she marches right back to old Mr. Wind's house, who gives her something else to take home. This was a fun story. Willa was a feisty character to root for! You might be happy to know that the thieving innkeeper got his comeuppance in the end, too. The illustrations were full of life, and interesting from an artistic point of view. They had a mix of mediums going on; very well done. 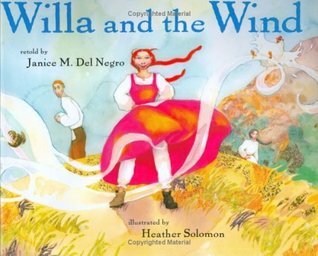 The wind looked almost translucent, while Willa had flaming red hair and a bright orangey-red dress that really popped against the greens and grays of the background. An old winter wind is very tired and wants a place to rest. He keeps trying to find a good spot, but he keeps being driven away. Finally, he gets very angry, and becomes a huge raging storm. 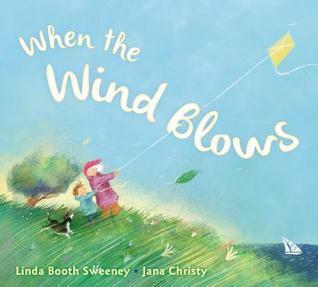 At the height of the storm, a little girl has the courage to ask him what is wrong. It just so happens that she knows of a place he can rest. He is finally able to have a nice long sleep, and before he goes in the spring, he leaves a surprise behind for her. This definitely had the feel of a folktale, with both kind and unkind actions bringing big consequences. 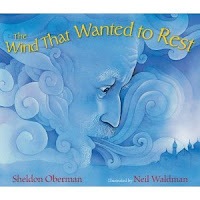 The watercolor illustrations were lovely, mostly done in hues of blue and purple. I especially liked the sharp-nosed mountain and the compassionate little girl who saved the day.